Hers was a life unlike any other. Whether walking with kings or walking barefoot with Gandhi, it was a journey of extremes managed effortlessly, living as she did with grace, dignity and, always, loving guidance. Shri Mataji’s was to be a truly remarkable path. Born of a royal dynasty, she conferred as a child with Mahatma Gandhi, living for a time in his ashram, was a medical student and a freedom fighter, was an adored mother, grandmother, great grandmother and the wife of a distinguished diplomat who himself was decorated by the kings and presidents of innumerable countries and knighted by the Queen of England. But incredibly, after all this, with her family grown and settled, she then embarked on an even more extraordinary mission. She said – There can be no peace in the world until there is peace within. Nirmala Srivastava, later to be known as Shri Mataji Nirmala Devi, was born on March 21st 1923 to Christian parents in India. Spiritually enlightened, she knew from very early on that her unique spiritual gift must be made available to everyone. And so it was that in 1970 she founded Sahaja Yoga meditation, which she shared freely. Using simple techniques, she discovered a unique process of Self Realization through which huge masses of people could easily achieve the peace of true meditation. She charged no money, and instead insisted this was a birthright which should be available to all who desired it, at no cost. Thus began the next outstanding stage of her life: for the next forty years, she continuously travelled the globe teaching meditation; was a loved and loving spiritual leader, acclaimed public speaker, gentle guide, philanthropist, Nobel peace prize nominee, and recipient of numerous awards and commendations worldwide. Extending her care and compassion ever further, in India she established a holistic health and research centre in Mumbai, an international cancer research centre in Mumbai, a charity house for destitute women and children in Delhi and an international Music Academy in Vaitarna to promote classical music and arts. Although at birth she was named Nirmala, meaning ‘Immaculate’, eventually she came to be known as Shri Mataji Nirmala Devi – the revered Mother. She was regarded by many as the most significant spiritual figure of our times. Regardless of race, religion, age or status, probably millions of ordinary people have now learnt how to tap into their inner spiritual power through Sahaja meditation, helping to find balance in their lives. And at meditation centres throughout more than 80 countries in the world, her legacy will live on, with volunteers continuing to teach her techniques for free. In the spirit of her teaching, those who have been helped will then help others, like one candle lighting another. Shri Mataji was described as ‘an Avatar of the modern era’ by Claes Nobel (grand-nephew of the creator of Nobel Foundation). And in the hearts of her followers, she will remain evermore, the all compassionate Mother. H.H. Shri Mataji Nirmala Devi is survived by her husband Sir C.P. Srivastava, daughters Kalpana and Sadhana, grandchildren & great grandchildren, and her worldwide family of countless devotees. She will be laid to rest in India. Shri Mataji’s parents Cornelia and Prasad Salve, a direct descendant of India’s reputed royal Shalivahana family, played a key role in India’s Liberation Movement from British rule. Her father, a close associate of Mahatma Gandhi, was a member of the Constituent Assembly of India and helped write free India’s first constitution; was a renowned scholar, master of 14 languages, and translated the Koran into Marathi. Her mother was the first woman in India to receive an Honors Degree in Mathematics. As a child, Shri Mataji lived with her parents in Mahatma Gandhi’s ashram, where he affectionately called her Nepali, because of her facial features. Even at a young age, her wisdom and deep understanding was evident to Gandhi, who was known to have sought her advice on spiritual matters. 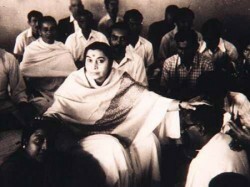 Shri Mataji studied medicine until becoming a student activist in the Free India movement, when both her parents were jailed. 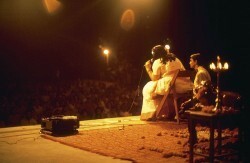 For many decades Shri Mataji kept a remarkable schedule at her own instigation, travelling tirelessly around the world teaching Sahaja Yoga meditation, showing how to effortlessly trigger the awakening of the individual’s spiritual power or kundalini, at one time as an official guest of the former Soviet Union, addressing an audience of 100,000 people. Whether speaking in the Sydney Town Hall, the Royal Albert Hall in London, immense stadiums in India, addressing the United Nations in New York, or travelling by bullock cart to crowded dusty fields in rural villages, she gave thousands of talks to packed audiences. Throughout, she always maintained that people cannot pay for spiritual enlightenment and denounced false self proclaimed ‘gurus’ who were more interested in money than spiritual ascent. In 2005 she personally donated properties to the Sahaja Yoga worldwide collective. Shri Mataji received numerous recognitions for her selfless work and lifetime achievements. These include being awarded the UN peace medal, nominated for the Nobel peace prize, official guest of China as keynote speaker at Beijing International Women’s Conference, granted a one hour nationally broadcast television series by the Indian Government, given a Proclamation by the US Congress, given Unity Award for international understanding, declared Personality of the Year by Italian Government, Mayor of Brazil’s capital gave keys to the city and sponsored all her programs, officially greeted by North American Mayors of Los Angeles, New York, British Columbia, Cincinnati, Philadelphia, Berkeley and invited by officials of many countries to address their people. You can download this Press Release Feb 25th 2011 in full. 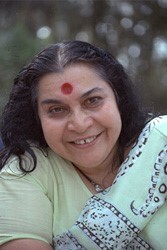 Learn about the life, work and travels of Shri Mataji Nirmala Devi with videos, photos and more.